AZTEC – Aztec High School 10th-grader Bill Kearney was working on a project in his first-period math class when he heard what sounded like someone slamming a book on a desk in the classroom across the hall. Students and teachers quickly realized the noise was gunshots. Kearney hid behind the teacher’s desk before being instructed to hide in a utility closet. It is unknown exactly how many shots were fired Thursday morning during the shooting that would end up leaving three people dead, including the gunman, in this small town 35 miles south of Durango. The San Juan County Sheriff’s Office identified the two victims as Casey Marquez and Francisco Fernandez. New Mexico State Police confirmed the shooter was a male but declined to identify the suspect or say whether he was a student. Law enforcement provided few details Thursday afternoon during a news conference. They said the investigation is ongoing and more information will be provided in the upcoming days. They declined to say how many weapons were used or what kinds of weapons were used and how the incident unfolded. It was unclear how the shooter died. The Aztec Police Department was the first to respond after dispatch received a call about the shooting shortly after 8 a.m. Chief of Police Mike Heal said police were able to force entry into the building through a window. Besides the three deaths, no one was injured. Authorities checked each room and each building at the school before the students were bused to be reunited with their parents. The school remained cordoned off Thursday night as the community gathered for a candlelight vigil. The Aztec Municipal School District canceled school Friday. Speaking at the news conference, New Mexico Gov. Susana Martinez said several acts of bravery by students, staff and teachers helped save lives during the shooting. The governor described the day as difficult and called the shooting a heinous and horrific act. After the school was out of lockdown, students and staff were bused to McGee Park in nearby Farmington, where they were reunited with family. As parents, students and community members huddled in the cold, crying, they were in disbelief. Jena Roberts-Thomlinson was living every parent’s nightmare when she heard reports about the shooting. Her daughter, Baily Ramirez, is a 10th-grader at the school. Roberts-Thomlinson said she felt a “rush of emotions,” but at the forefront of her mind was a fear for her child’s safety. Kearney’s grandmother, Joy McDonald, a lifelong Aztec resident, said it was “hard to register” what happened. McDonald watched the scene unfold from her home across from the high school, alongside her daughters and grandchildren. She expressed frustration at being so close to her grandson but unable to help him. Inside the school, students had scrambled for safety. Ramirez said she was in study hall when the shooting started. Her teacher immediately told the students to hide because it was not a drill. Tenth-grader Samantha Hill, who lives with McDonald across from the school, said she was startled awake by the gunshots. She was home with a hip injury that left her unable to participate in her weight-lifting class and was gripped by fear as she watched helplessly as police stormed the school. Hill woke her aunt, Loretta Mitchell, who is Kearney’s mother, to tell her about the shooting. Mitchell said she tried unsuccessfully to reach her son several times. “I could see him standing outside the school from over here, and I know he was so scared,” she said. The tragedy shook the confidence of Aztec, but as the chaos settled, the heart of the small community began to show. Cousins Alton Garcia and Dylan Herrera stood near the intersection of West Aztec Boulevard and U.S. Highway 550 and held signs asking for prayers for the children of Aztec. Garcia called the incident “eye opening.” He said it is important for people to know there is hope. “There is so much hate in this world, you need at least one person to show you that God is in our lives and there is a spark of hope everywhere,” he said. “I don’t think anyone ever expects a tragedy of this level in their own backyard,” he said. Aztec High School shooting The Aztec community mourns after a gunman killed two students at Aztec High School on Thursday morning. The shooter also died. 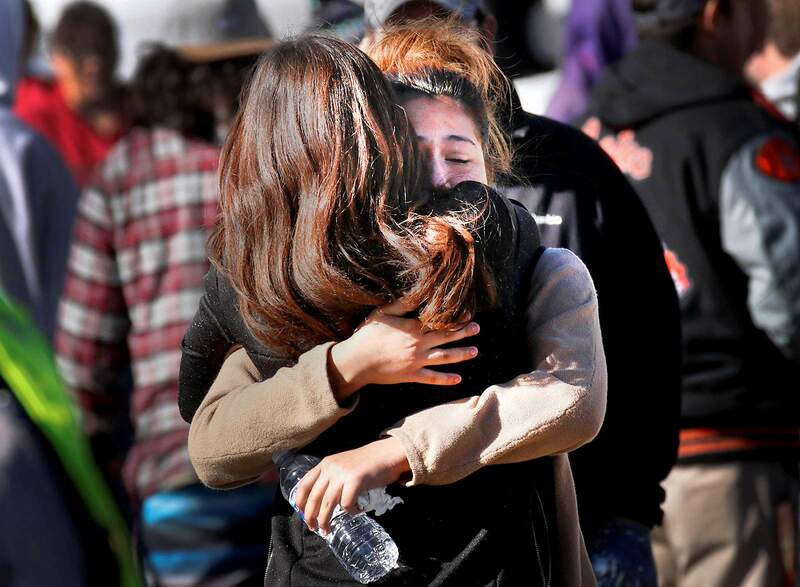 The Aztec community mourns after a gunman killed two students at Aztec High School on Thursday morning. The shooter also died. Emotions were high among Aztec High School students Thursday at McGee Park in Farmington after a shooting at the school. One gunman killed two students. The gunman also died. Immediately after the incident started, the school went into lockdown. Students were then bused to the park to be reunited with their families.